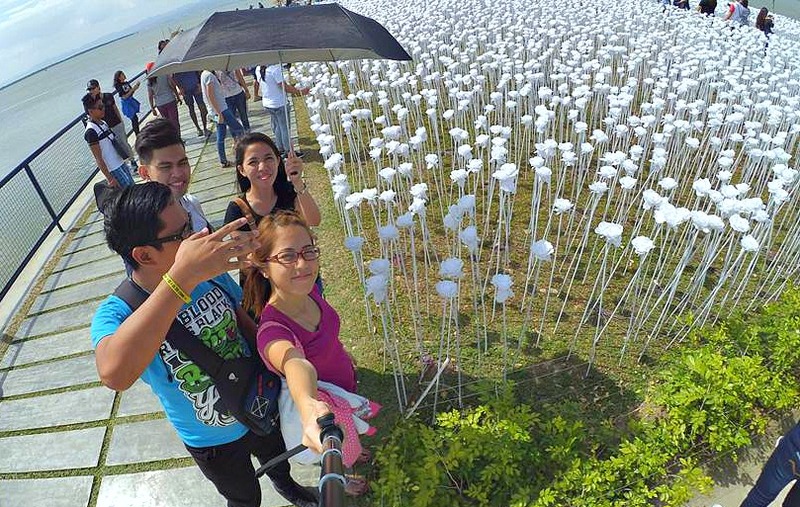 The Cordova 10000 Roses Café is nowadays one of the most popular places in Cordova, Mactan Island, Cebu, Philippines. The café is located in Barangay Day-as in Cordova. 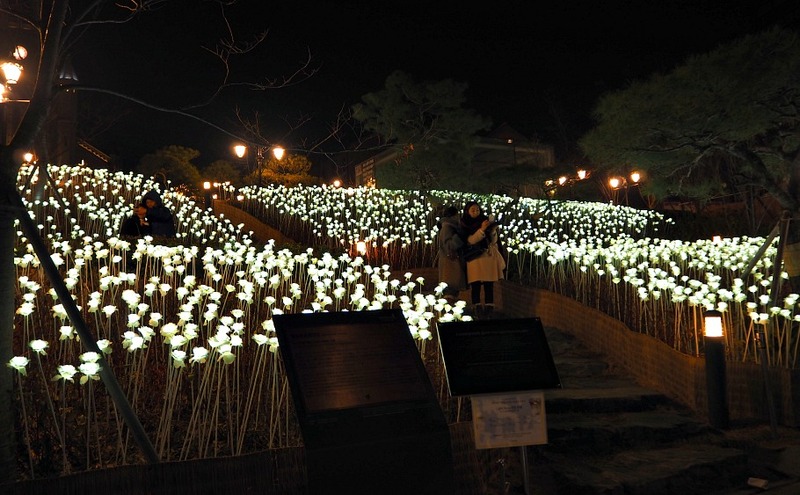 The Influx of visitors to the place come to see for themselves and enjoy the white light emitting from within the white flowers themselves. 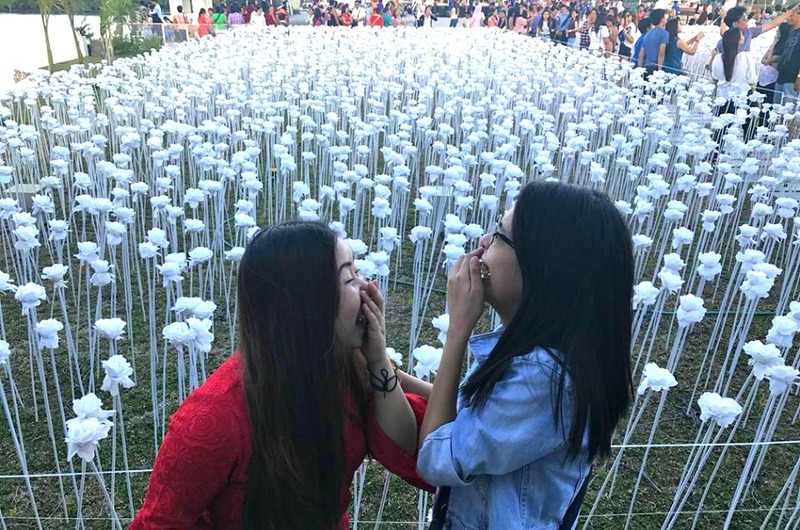 By the way, they are not real flowers, apparently, but made of synthetic and plastic petals each supported by metals that serve as stems making stand. 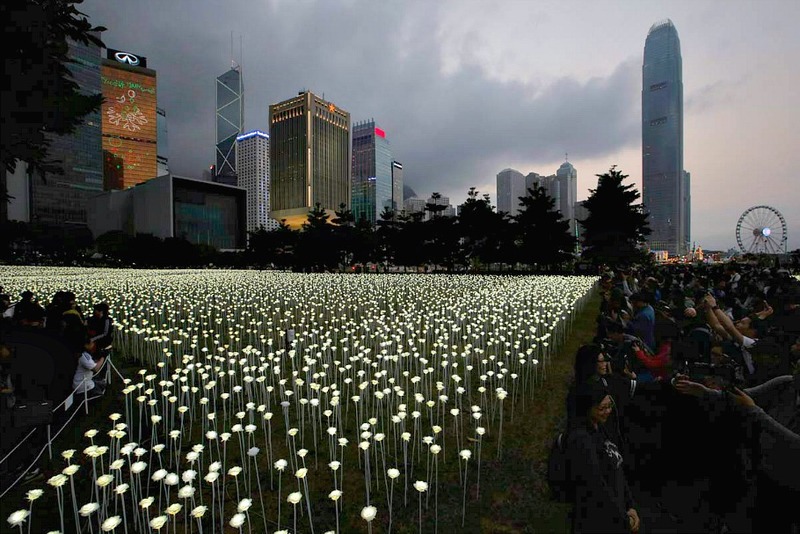 When the power is turned on, they are turn into glowing field of flowers which creates like a fantasy dreamland. By the way, the technology is called LED (light-emitting diode). When the wind blows, or if there is a breeze, the 3-feet tall flowers dance with it. When you are near or within the area, you will feel surreal beauty especially when darkness comes. The café itself is a simply-designed square-shaped structure. The inside is of course furnished with nicely-crafted tables and chairs strategically positioned at most of the spaces inside the ground floor building. Yes, you can directly approach the staff waiting for your orders. Viewing Deck. It is just right atop the café. The deck is surrounded by glass walls just enough to stop you from moving beyond the space. The viewing deck gives you much higher and wider viewpoint of Mactan Island and the night lights enlivening Cebu City in the cover of darkness. From the deck, you will also be captivated by the fantastic view of the sea and everything that your eyes can see. In the late afternoon, you will be praising the sight of the setting sun and its wonderful colors giving you wonderful feelings and a sense of hope that the sun will rise again tomorrow. You can observe anything from this viewpoint while standing or seating on a chair. Love Locks Fence is also being installed. Of course, it is not the first in the whole world but could be very meaningful for couples who made vows (or just starting) to be together forever or ‘til death do us part' thing! 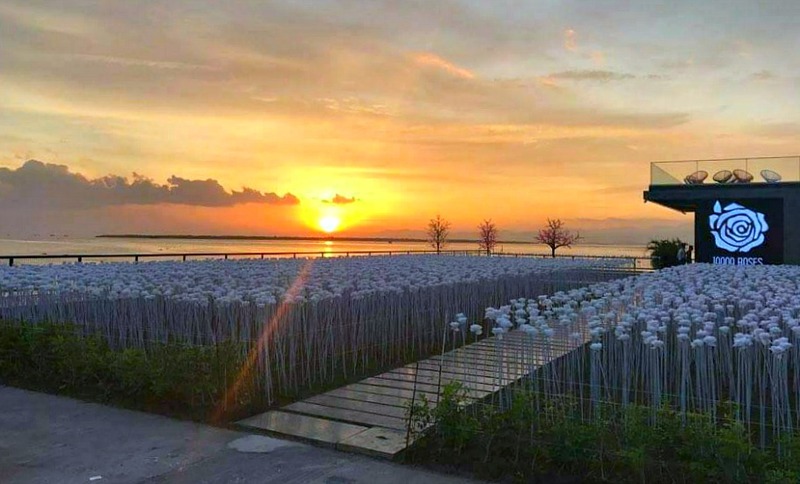 The 10,000 roses are set on the wharf of Cordova. At the back part of the Café, you can see the aesthetic sight of Cebu City and feel caressed by the evening breeze. The facilities and services are quite simple. There are seats available just outside the café to accommodate guests who cannot get seats inside the café itself due to its limited space. But having drinks outside could be preferable for some who want to get a better and wider perspective of the area. Of course, as a café, you can get the usual food and drinks you can find in such similar places anywhere in the world. The Café serves lunch and dinner – but you should not be expecting that they serve like those real restaurants as they can only prepare fast foods – such as snacks, pizza, and spaghetti. By the way, if you want to know what varieties of pizza and spaghetti they serve, let me tell you. For pizzas, they have Gorgonzola and Margherita Pizza and more will be available on their menu. For kinds of pasta you can order Alio Olio, Anchovy Pasta, Bacon pasta, Ragu Pasta, Marinara Pasta, 4-Cheeses Pasta and Pane Pasta. For snacks, you can try potato fries, nacho with Salsa, Cheese Plate, fruits plate, etc. To include all food available, you can buy choco muffin, pastries, pizzas, salads, snacks and plates of pasta, and various desserts and bakes. Expect that there will be changes - availability and additions - to the menu above for much better service. Free parking and smoking area are available. Karrie and a friend having fun! One can readily say that the place is romantic. Fundamentally, that's the reason behind the hype of this site. Seeing such art, especially during the evening time, is another source of attraction and not only for the romantic ones. It is out of curiosity and eagerness to see what is new and unique about this place that attracts the flocks of visitors. According to the interview conducted by Philstar Cebu of the café owner, the place is definitely meant to be a romantic place and pure love between couples, which are symbolized by the white roses. White symbolizes purity, innocence, and even spirituality. Even in the early times, white roses are being used as a symbol for true love. For that reason, during many wedding ceremonies, wedding planners use white rose as a bridal rose. Historically, way back in the 14th century England the white roses was the heraldic symbol of the Duke of York (which fought against the red-rose Lancaster family and gave the well-known War of Roses). Anyhow, today which rose has retained its meanings with pure love and being associated with formal ceremony and being used for unions and ceremonial occasions including christenings, anniversaries, graduations and, of course, weddings (source: proflowers.com). Where else can you find them? I was surprised when I saw at facebook the hype about Cordova 10000 Roses Café. I know that the looks and the way it is ‘planted' and arranged on the ground look so familiar. Yes, I remember that I have seen them first in South Korea. I first saw them on Songdo Island, a newly-developed international business zone located close to Incheon Airport. 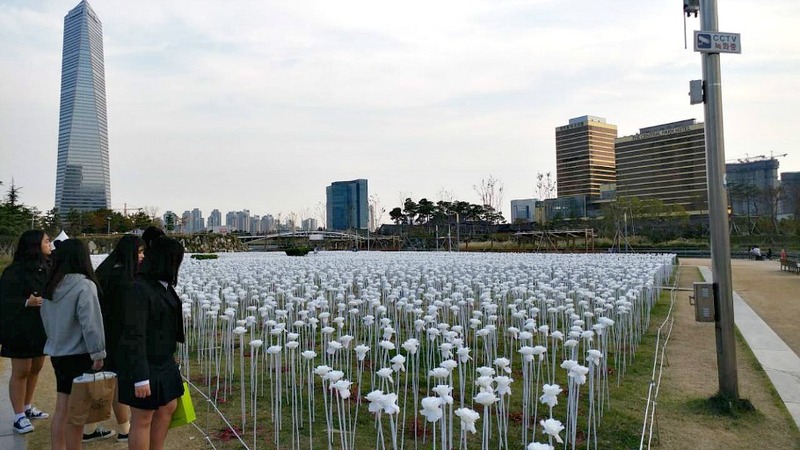 The white roses caught my sight while I was strolling at Songdo's Central Park, the main attraction of the island. I took two shots and was thinking to come back to it in the evening because there was a notice that say it will be lighted by that evening – but I didn't return. During Christmas Day in 2015, I attended the mass celebration with my wife and a friend in Myongdong Cathedral, Seoul. To my surprise, I saw again these same white roses. But the difference this time is that they were all lighted up – it was late in the evening! I believe they were the same roses I saw in Songdo. Being captivated by their beauty, I took some photos and asked my friend to take a few shots as you can see below. 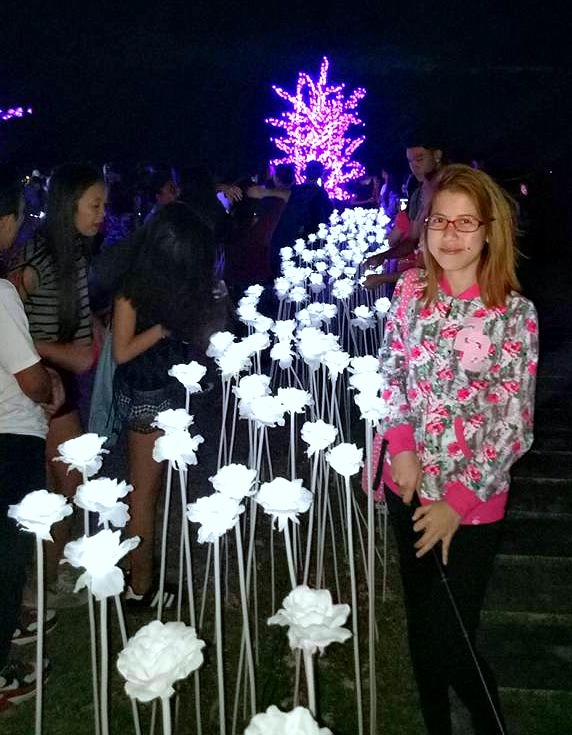 Yes, you can also enjoy and take photoshoots in Hong Kong the famous white LED roses. The design of the flower came from the inspiration of Seoul's Dongdaemun Design Plaza area, according to the interview done with Mr Cho (café owner). Dongdaemun Design Plaza (2007-2013) is a new structure built where the former Dongdaemun sports facility was. If you are enticed by the beauty of the white roses, you are so right for feeling so. That's because the designer of Dongdaemun Design Plaza was someone very special in the world of designs and architecture. I said ‘was' because Zaha Hadid passed away on 31 March 2016 (aged 65). Her full name is Zaha Mohammad Hadid and was a British-Iraqi. Dame Hadid designed many structures including ski jumps, arts centers, museums, bridges, university buildings, opera houses, among others. 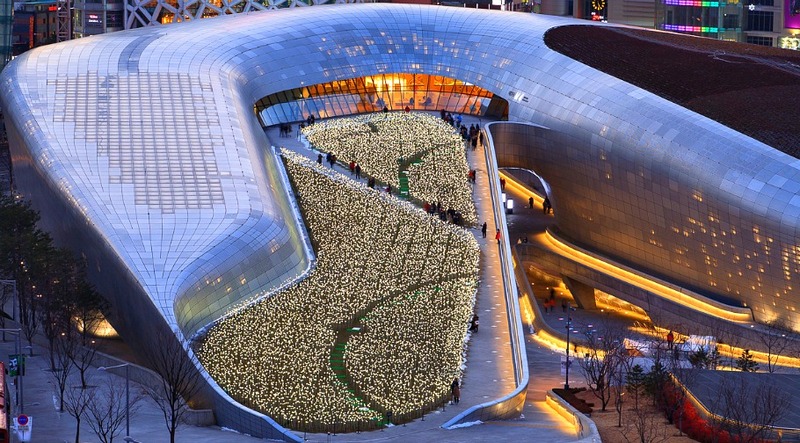 The Dongdaemun Design Plaza was completed in 2013 and is now one of the must-see places in Seoul. 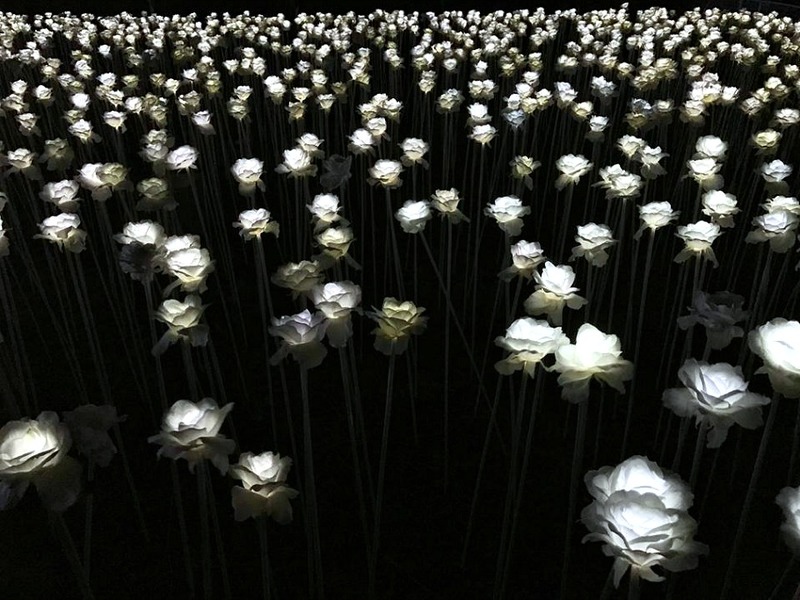 Anyway, the inspiration behind Cordova 10000 Roses Cafe is not the Dongdaemun Design Plaza itself but the white LED roses that add more aesthetic and romantic ambiance of the whole plaza. There is no entrance fee to get to the Café. And, originally one didn't have to pay anything to get to the area. However, the tourism office of Cordova decided to impose and environmental fee to all those entering the area due to some environmental issues. Some visitors are not enlightened enough to throw their garbage into the right places. So, to help maintain cleanliness, the environmental fee is imposed and the proceeds are being used to clean up regularly the area including the garbage in the sea water around the wharf area. The fee must be paid by all visitors at the Municipal Tourism Office at the Municipal Hall before entering the vicinity of the Café. The fee is also legally agreed through the joint venture agreement which was signed by the municipality and Cordova-Cebu Gold and Resort Corporation. It is near the end part of Cordova Tourism Cebu and next to Lantaw Floating Restaurant. You can always get any transports that will bring you there. If you are not using a private vehicle, you might need to take at least two to three modes of transportation, depending on your original departure location. You can take a Jeepney and get off at the closest stops then take a tricycle or tricycad (tri-sikad) straight to the Café. If you are at the wharf area, you can hire ‘habal-habals' to bring you back where the Jeepneys make their stops. Taxi is another transport that can bring you much closer to the wharf area. There is a parking space where you can park your private vehicle as well. If you reached this far, thank you so much for reading. Wish you the best in your visit to the Café.